Gary Brandner. 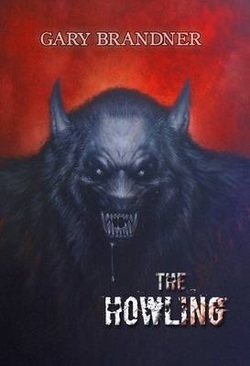 The Howling. Collectors Edition. MHB Press 2010. 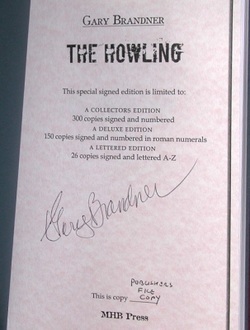 One of only 300 numbered copies signed by the author. DJ artwork and interior illustrations by Dan Harding. 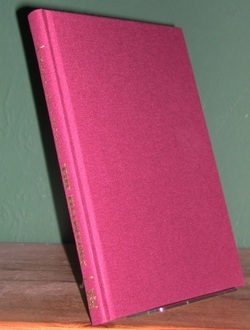 Sewn book block, bound in Colorado cloth with headbands, coloured endpapers and bound in ribbon bookmark with DJ. Synopsis : Karyn and her husband Roy had come to the peaceful California village of Drago to escape the savagery of the city. On the surface Drago appeared to be like most small rural towns. But it was not. The village had a most unsavory history. Unexplained disappearances, sudden deaths. People just vanished, never to be found.